Option One: creating multiple domains under the same organization. -All users will have the same address book and will be under the same plan. 1. Each domain will have its Global Address List. 1. Open WorldPosta Control Panel (admin.worldposta.com). 2. in System section, click on Domains. 3. Click on Add Domains. 5. In the Domain Name field, enter your domain. When you finish, click on Add Domain. 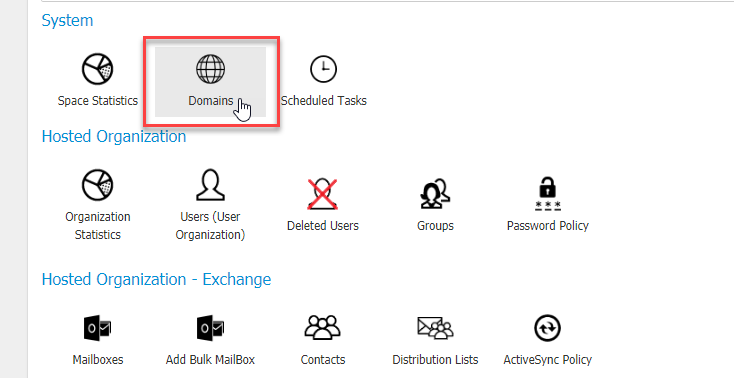 Now, in order to be able to add your domains to the domains list, you must add it to the accepted domains.
. From the sidebar, click on the organization menu > Hosted Organization. A new page will appear. Click on Create New Organization. Enter your organization Name, and Organization ID, then select Create Organization. You can easily switch between your organizations by choosing from the top-left-corner menu.